Size: 380 x 510 mm. Full Title: 'The Countie and Citie of Lyncolne Described with the Armes of Them That Have Bene Earles Thereof Since the Conquest'. Sold by Bassett & Chiswell. From the 'Theatre of Empire Great Britain'. A highly decorative map of Lincoln with an elaborate title cartouche, compass rose, ship, sea monster, an inset city plan, and numerous coats of arms. When described by Speed, the County of Lincolnshire was divided into six zones. These zones included lowland, two upland areas, a river valley, the coast, and fenlands. Lincolnshire's economy was largely dependent on livestock and corn production. Reeds from the marshlands were used for thatching and covering floors and flax was used for making linen. Some trade took place along the Lincolnshire coast; however, the mudflats and sandbanks of the area made coastal shipping somewhat hazardous. There was an overall economic depression in the kingdom and her counties that perhaps explains why visible decay and recession characterized the land and is apparent in Speed's less-than-grandeur detail of Lincoln. 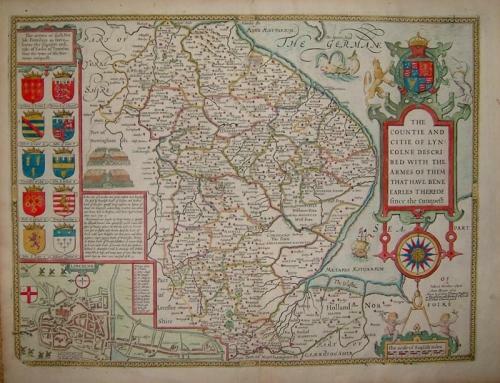 The convention of orienting a map north-south proved to be a problem in his depiction of Lincolnshire, a largely east-west oriented county. This problem was resolved by adopting a much smaller scale than generally employed. The map is in very good condition.